A Diamond Select Toys release! Add some laughs to your bust collection with the Harlequin of Crime! Dr. Harleen Quinzell, a.k.a. 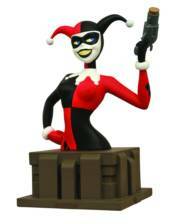 Harley Quinn, is the second bust in DST's line or resin busts based on Batman: The Animated Series! Capturing Bruce Timm's timeless design in three dimensions, this approximately 6' tall bust of the Joker's madcap assistant sits atop a decorative base inspired by the show and comes packaged in a full-color box with a certificate of authenticity. Limited to 3,000 pieces!